It was an easy drive and I had left really early. By noon or so I had located the first site I wanted to investigate. The old geologic map noted kyanite in granulite facies metamorphic rocks on the side of a small hill in a rural area. The land was on a State Forest with some trails, but the two k’s (marking kyanite) on the 1930’s vintage geology map I had discovered were distant from any trail so it was cross country hiking. I set out, first to find rocks, then to find outcrop, and I hoped large bright blue kyanite. The walk was generally easy and visibility through the forest was excellent. There was little low level vegetation to block the path or the view and only a bit of remaining snow in places. A few small pieces of schist float contained mica and miniscule garnets, but nothing worth a second look, leaverite for sure. After perhaps an hour (I had lost track of time) I happened upon a couple of granitic boulders that must have been glacial erratics. Interesting, and I hit one a few times, but it resisted and I did not see much reason in being persistent. Soon after that, I saw a low ridge running parallel to the contours on the small hill I was climbing and I bee-lined it to the outcrop. It was schist, but the weathered surface was dull, locally iron-stained, and partially covered by lichen and moss. It did appear, though, that I was smack on the location where one of the k’s on that old map had been placed. It was time to break out the hammer and knock off the weathered surface. The first several breaks exposed fresher rock, but the breaks were aligned with weaknesses in the schist and they were iron stained. When I finally broke into truly fresh rock, I was rewarded with blue bladed kyanite. It wasn’t Minas Gerais (Brazil) quality blue, but it was blue and it was kyanite. I found a crack running further into the outcrop and tried to get deeper. The exposure surfaces were getting even bluer, the blades were getting longer. I was in heaven. How could I have been so lucky and this was only the first of several planned stops on this trip. I struggled a bit to stretch myself so I could reach deeper into the crevice to reach what appeared to me to be a bluish sheen, bluer than anything I had extracted so far. Suddenly a voice rang out, “What are you doing”. I was petrified. I thought I was all alone and fairly deep into the Connecticut forest. “Stop kicking me”, my wife exclaimed as I suddenly woke up from my dream. There was no kyanite in the bed, the Honda Accord was safely in the garage beneath me, and I was sweating rather profusely. On the bright side, I had not gone collecting at a location where it is not allowed. One can collect in one’s bed whenever one wants, spouse permitting. Maybe next month I will obtain the necessary permissions in Connecticut and make that trip for real. It will be déjà vu all over again. So you thought the kyanite with garnet picture at the top of this article was one that I found? Nope, that’s what I dreamed it looked like. The one in the picture is actually from somewhere in Russia. I found it online just like the Connecticut locations. 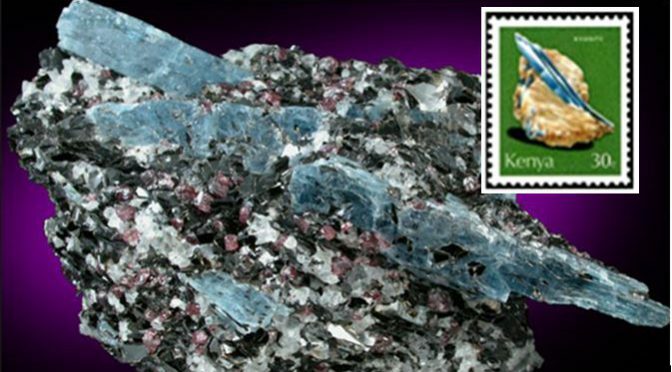 I do, however, own several copies of the Kenya stamp with kyanite in the upper right of the cover photo!